I am always on the look out for inexpensive tools to incorporate more gross motor activity into our daily routine. One of the most simple and versatile toys you can buy is a hula hoop. I recently bought four at Target, one for each of my boys. Only my oldest, JZ (6) is able to use the hula hoop for its intended purpose, but there are countless other gross motor skills to be gained with a hula hoop! 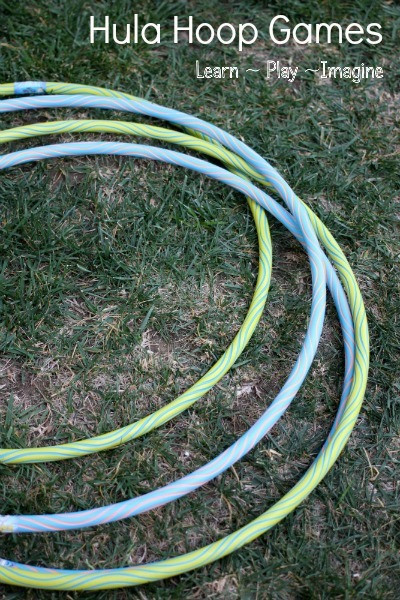 Here are several of our favorite hula hoop games, suitable for toddlers on up. Line up every hula hoop you own, and hop into the center of each one. Hopping with two feet together is a gross motor skill most children learn around the age of three. It is an important skill, because it helps children have control over their body movements. By setting up intentional gross motor activities children are able to control their movements and have control of their own personal space. With younger children I like to encourage hopping with both feet together without any obstacles in place. JZ gave himself the extra challenge of hopping into every other hula hoop. For a child who has mastered hopping, the next gross motor activity I suggest is hopping on one foot. This skill requires even more control and balance. After my boys hopped across the hula hoops on one foot I had them go back and hop on the other foot. If your child isn't ready to hop on one foot, you can introduce the skill by encouraging him to stand still on one foot at a time. The next challenge is hopping sideways. Be sure to encourage children to hop both directions, to equally strengthen their muscles. JZ and I love to toss a hula hoop into the air as high as we can and catch it. The goal is to always catch it, so this takes control while throwing the hula hoop into the air. The impulse of a child is to send the hula hoop into the air as high as possible, but the challenge of catching the hula hoop gives direction and focus to the throw, make it more intentional. We race our hula hoops in two different ways. The first race is a competition. We each roll a hula hoop as far as we can. Whoever rolls the hula hoop farther wins. For older children you could enforce boundaries and interference if one of the hula hoops hits the other, but we keep it as a simple race for now. The other way we race is my favorite. We roll our hula hoops and try to outrun them. The objective is to run past the hula hoop while it is still in motion. For this game I set out markers for the boys to toss the hula hoops onto. The goal is to ring the hoop around one of the markers. I used domes. You could also use cones, milk jugs, water bottles, toys, or anything that stands up. For an added gross motor challenge, and to practice math facts, we gave each color dome a point value. Tank and Peanut (23 months) naturally want to participate in all of our games. A simple way to include toddlers in gross motor activities with hula hoops is by holding up a hoop for them to walk through. The added bonus is watching the sibling bonding gone on during the game. In addition to spinning a hula hoop around our hips, we try to spin one around our neck, arms, and legs. Another favorite way of mine to include toddlers in the hula hoop games is by simply walking around a hula hoop. The easiest way to get a toddler involved is by modeling the action, so I put my camera down and started walking around the hula hoop. J-Bug wanted us to walk around two hoops. Then he added a third hoop. A modification on the hula walk for older children is to have them keep one foot inside of the hoop at all times whiles walking around the outside of the hoop with the other foot. Another gross motor skill that takes focus and control is stepping on a flat hula hoop and catching it as it flies upward. 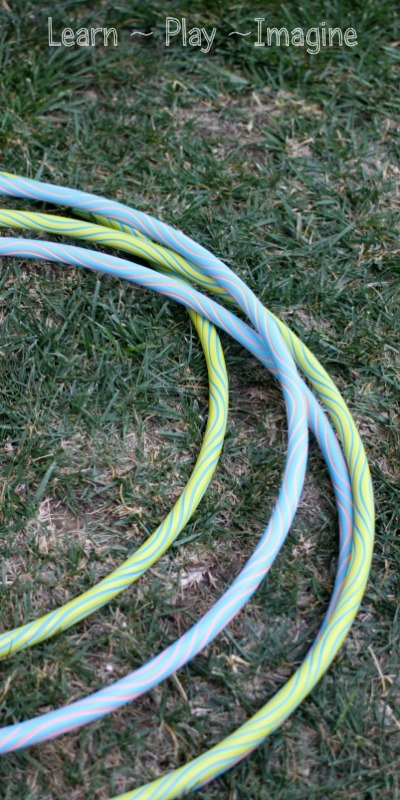 There are eight of our favorite ways to work on gross motor skills with hula hoops. For more gross motor activities follow me on Pinterest. Okay, we need more hula hoop. This is a GREAT post, Allison - my daughter always wants me to play something new with her outside, and I'm usually stuck. We'll be trying some of these for sure! Love this! "Hopping" by from the Kids Co-op. My 3 year old got a hula hoop for her birthday and would enjoy several of these, even with only one hoop! Very cute! Heading to pin!